Porsche is rumored to be introducing a four cylinder engine for the Boxster in a couple of years. If you can't want for a mid-engine wasserboxer from the house of Ferry then perhaps today's Nice Price or Crack Pipe Subie-914 will suffice. That is, if its price is out of the box. If you consider folks like Hoffa, Dean, Carter, Kimmel, and Olsen there are a lot famous Jimmys out there. And to that inconsequential trivia list you can add yesterday's 1985 GMC Jimmy, as it gained both fame and fortune, as well as an amazing 92% Nice Price win. Have you ever heard the phrase a bad penny always comes back? That's a reference to unwanted associations but it derives from the 18th century and that era's counterfeit coins, the original bad pennies. Today's 1975 Porsche 914 has been nicknamed Dirty Penny owing to its copper color and apparent condition when originally obtained. It's a lot cleaner now, and a lot more Subaru-powered too, so maybe its new owner might want to come up with a new sobriquet for it. Dirty Penny was built for the Grassroots Motorsports $2011 Challenge and was found as a roller that had been sitting for some time in the Texas sun. Yes, Texas even has its own sun. Seeing as the car came sans engine, something had to be done, otherwise in the GSM Challenge all it would have been able to compete in would have been the bikini portion of the contest. Instead, the seller decided to bring the 914 back to life and just like Porsche eventually acquiesced, he decided to go both flat and wet. The engine of choice was a JDM Subie EJ20G turbo four sourced from a Dallas seller. That's a mill good for somewhere upwards of two bucks worth of power, far more than the 76 or so the 914's original VW engine could manage. Since this was a GSM $2011 competitor, everything had to be done on the cheap. That doesn't means that it had to be done wrong, just with a lot of penny pinching (see what I did there?) whenever possible. You can see the entire build and tuning thread here. Along the way Penny received a set of Rivieras, Boge/Koni shocks, a Megasquit ECU and a Nissan Versa shift console for what the seller describes as 'incredible ergonomics driving cable shift.' Also, all your bases are belong to us. The ad notes the availability of an extra engine, for extra money of course. It also points to some possible issues with the ride, including the fact that this was not built as a restoration but nominally as a track car. It does appear to be licensed for the road, and seems pretty much ready for street, but don't expect to be welcomed with open arms at the next Porsche Concours. Other issues are a noise in the gearbox which the seller seems to think may be the 5th gear input shaft bearing, and an interior that's more amusement park durable than automotive luxurious. Still, the cobbled together drivetrain seems to work okay and could be made even better. Plus, who doesn't love an oddball old car that goes like stink? If you count yourself among those lovers, you might want to start counting your pennies to see if you have enough to cover the $5,000 price tag of this pumped-up Porsche. 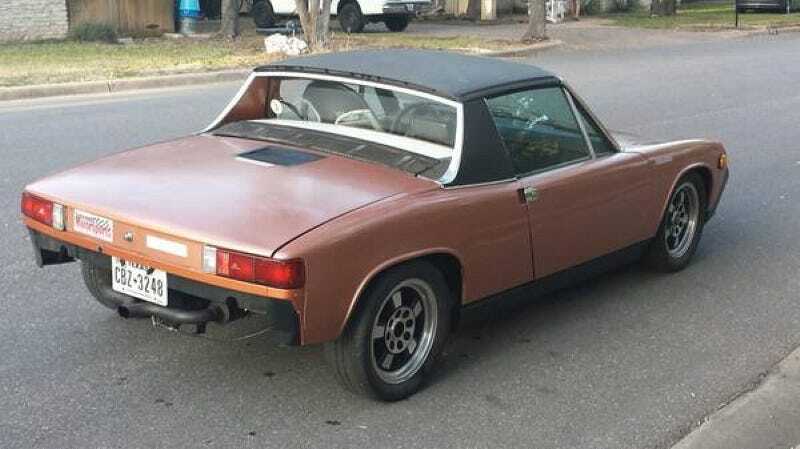 What do you think about that price for this 914, does that seem like a deal? Or, does that not pass your $5,000 challenge? Austin Craigslist, or go here if the ad disappears. H/T to Muthalovin on Craigslist Crapshoot on Hooniverse!